King Solomon was the wisest man who ever lived and also one of the most foolish. God gifted him with unsurpassed wisdom, which Solomon squandered by disobeying God's commandments. Solomon was the second son of King David and Bathsheba. His name means "peaceable." His alternative name was Jedidiah, meaning "beloved of the Lord." Even as a baby, Solomon was loved by God. A conspiracy by Solomon's half-brother Adonijah tried to rob Solomon of the throne. To take the kingship, Solomon had to kill Adonijah and Joab, David's general. Once Solomon's kingship was firmly established, God appeared to Solomon in a dream and promised him anything he asked. Solomon chose understanding and discernment, asking God to help him govern his people well and wisely. God was so pleased with the request that he granted it, along with great riches, honor, and longevity (1 Kings 3:11-15, NIV). Solomon's downfall began when he married the daughter of the Egyptian Pharaoh to seal a political alliance. He could not control his lust. Among Solomon's 700 wives and 300 concubines were many foreigners, which angered God. The inevitable happened: They lured King Solomon away from Yahweh into worship of false gods and idols. Over his 40-year reign, Solomon did many great things, but he succumbed to the temptations of lesser men. The peace a united Israel enjoyed, the massive building projects he headed, and the successful commerce he developed became meaningless when Solomon stopped pursuing God. Solomon set up an organized state in Israel, with many officials to assist him. The country was divided into 12 major districts, with each district providing for the king’s court during one month each year. The system was fair and just, distributing the tax burden evenly over the entire country. Solomon built the first temple on Mount Moriah in Jerusalem, a seven-year task that became one of the wonders of the ancient world. He also built a majestic palace, gardens, roads, and government buildings. He accumulated thousands of horses and chariots. After securing peace with his neighbors, he built up trade and became the wealthiest king of his time. Solomon, a prolific writer, poet, and scientist, is credited with writing much of the book of Proverbs, the Song of Solomon, the book of Ecclesiastes, and two psalms. First Kings 4:32 tells us he wrote 3,000 proverbs and 1,005 songs. King Solomon greatest strength was his unsurpassed wisdom, granted to him by God. In one biblical episode, two women came to him with a dispute. Both lived in the same house and had recently delivered newborns, but one of the infants had died. The mother of the dead baby tried to take the living child from the other mother. Because no other witnesses lived in the house, the women were left to dispute who the living child belonged to and who was the true mother. Both claimed to have given birth to the baby. They asked Solomon to determine which of the two of them should keep the newborn. With astonishing wisdom, Solomon suggested that the boy be cut in half with a sword and split between the two women. Deeply moved by love for her son, the first woman whose baby was alive said to the king, "Please, my lord, give her the living baby! Don’t kill him!" But the other woman said, "Neither I nor you shall have him. Cut him in two!" Solomon ruled that the first woman was the real mother because she preferred giving up her child to seeing him harmed. King Solomon skills in architecture and management turned Israel into the showplace of the Middle East. As a diplomat, he made treaties and alliances that brought peace to his kingdom. To satisfy his curious mind, Solomon turned to worldly pleasures instead of the pursuit of God. He collected all sorts of treasures and surrounded himself with luxury. In the case of non-Jewish wives and concubines, he let lust rule his heart instead of obedience to God. He also taxed his subjects heavily, conscripted them into his army and into slave-like labor for his building projects. King Solomon's sins speak loudly to us in our current day materialistic culture. When we worship possessions and fame over God, we are headed for a fall. When Christians marry an unbeliever, they can also expect trouble. God ought to be our first love, and we should let nothing come before him. 2 Samuel 12:24 - 1 Kings 11:43; 1 Chronicles 28, 29; 2 Chronicles 1-10; Nehemiah 13:26; Psalm 72; Matthew 6:29, 12:42. 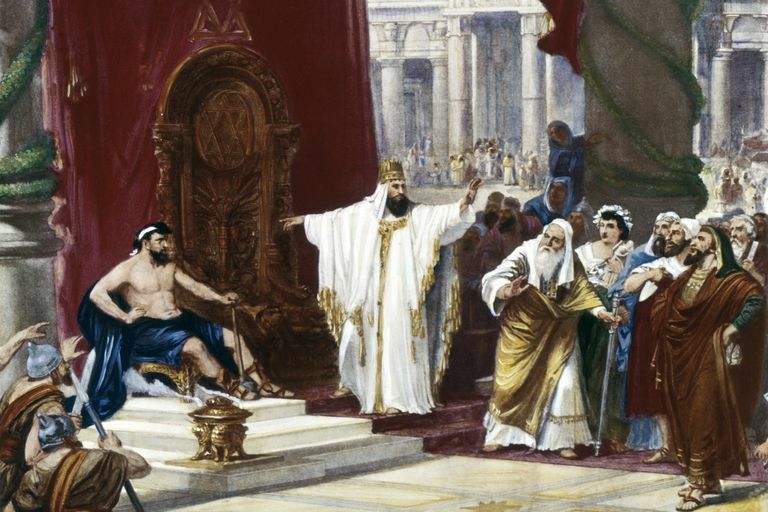 Solomon was the third king over Israel. Solomon ruled with wisdom over Israel for 40 years, securing stability through treaties with foreign powers. He is celebrated for his wisdom and for building the temple of the Lord in Jerusalem.